As some of you well know, I've been playing World of Warcraft for about 5 years now, and as you've probably also already noticed, I'm taking this vacation opportunity to nerd it up. 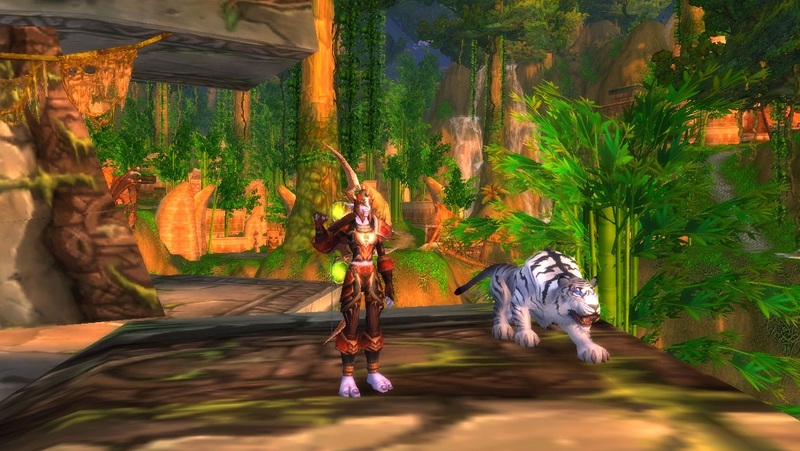 A lot of you have probably heard of World of Warcraft, but I want to tell you a bit about it. World of Warcraft is an MMORPG, which stands for Massively Multiplayer Online Role Playing Game. Which basically just means that it's a role-playing game (create your own character, your own role) but it's online with a lot of other people there at the same time. Not everyone role-plays, however. Some people are there just for the PvP (player v player), while others, like me, are there for PvE (player v everything). World of Warcraft was not the first game in the Warcraft series, it came about from the original game series, Warcraft, the most popular of which was the third and final game of the series (Warcraft 3), which is still played a lot today. This was not a role-playing game, but rather a strategy, where you would build bases, created your armed force, and fight off any threats. I played it for a short time, up to the Culling of Stratholme. 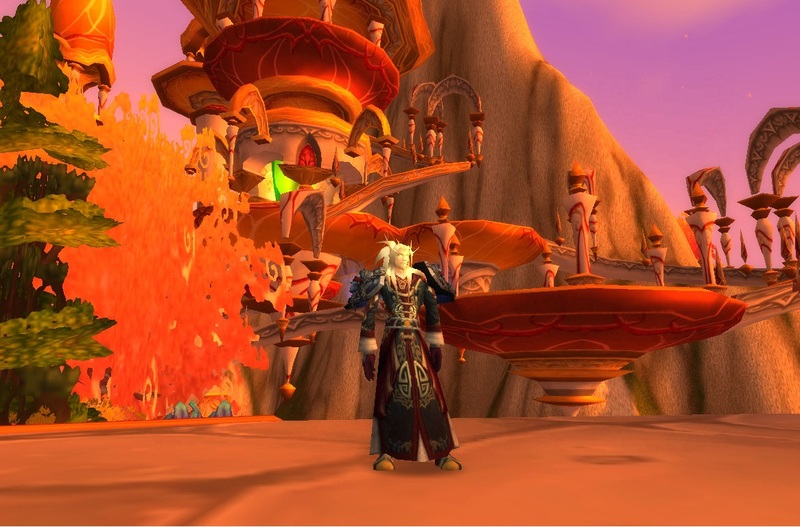 I started playing World of Warcraft during the Burning Crusade, which was the first expansion, but I didn't get my own account until Wrath of the Lich King, the second expansion, came out. Before getting my own account, I played on two other people's accounts, and by the time I had my own account, I had made my main character about three or four times, but I never got tired of it. I created Spinegrinder, my Undead Warlock, and she remained my "main" for some time. I wasn't much interested in making alternative characters - or "alts" - because I put all of my time into Spinegrinder. But I did try other races and classes a few times, but looking back on it now, Spinegrinder is the only one who stood the test of time. Spinegrinder, in her awesome Corrupter's Raiment, in Tirisfal Glades. The Wrath of the Lich King is often hailed as the best World of Warcraft expansion, and I'll also state that it was actually very good. I found the landscape - very cold and mountainous - was very attractive, the antagonist - the Lich King - was a very interesting villain if you knew his back story, all of which is contained within the book 'Arthas', for that was his name. I also absolutely loved Dalaran, the floating neutral city. There were a lot of vendors that sold useless rubbish like hats and cakes, and I just love novelty and vanity items in the game. Cataclysm, on the other hand, which was the third expansion, is hailed as the worst. Now, I don't think this is fair. It's considered a poor expansion because there wasn't much end-game content. This means that, when you reached the newest maximum level (which goes up by either 5 or 10 per expansion - from 60 - 70 - 80 - 85 - 90), there wasn't much you could do afterwards unless you liked to raid, and raiding is actually quite serious. You need a party of 10-25 players, and if you don't read up on tactics, the whole group can fall apart. I've never done a current-level raid. I killed the Lich King in Cataclysm with Seeg and some people from our guild, and it was hard, and we were a full expansion ahead. They released a new daily quest hub along with a raid, the Firelands, and it was really great stuff, but doing it with more than one character was very tiresome, and not many people did it. The reason I say that calling it a poor expansion is unfair, though, is because, while the end-game content was poor, they redesigned levels 1-60, which means they redid the zones, they redid the quests, and the whole levelling experience of the original game, pre-expansions, was changed. This meant that, while there wasn't all that much to do with your max-level characters, it was very easy to start levelling new ones instead. During this time I made a few new characters, which included Kharzil, a Blood Elf Shadow Priest, and Daeaye, a Troll Hunter, both of whom are the current max level of 90, along with Spinegrinder. Cataclysm is named Cataclysm, though, because Deathwing, the Destroyer, managed to begin tearing Azeroth apart, in a similar way that Draenor was (Outland). A recent book, 'The Shattering', talked about it and detailed that what was happening on Azeroth, if allowed to continue, would cause it to end up like the homeland of the Orcs - a floating landmass. This meant that, while 1-60 zones had been redesigned, they were redesigned for the "worse". There is now an enormous fiery chasm splitting the Barrens into two seperate zones; the dam has burst in Loch Modan, and the lake has drained; the Thousand Needles has suffered from a huge tidal wave, and what was once a desert with rock stacks, is now little more than a bay. During this time, as well, some zones which used to be neutral - meaning both Horde (Orcs, Tauren, Undead, Trolls, Blood Elves and Goblins) and Alliance (Humans, Night Elves, Gnomes, Dwarves, Draenai and Worgen) could level there - has been taken over by one faction or another. 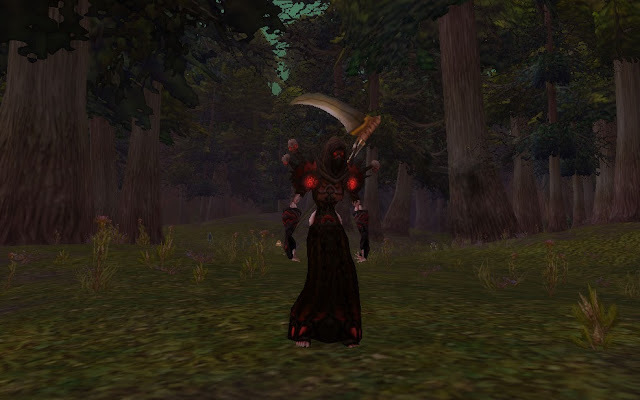 The best example is Hillsbrad, where the Forsaken of the Horde have finally attacked the Alliance village of Southshore and killed everyone there, making the entirety of Hillsbrad a Horde-only zone. But then came the Mists of Pandaria. Everyone made fun of this expansion, and even I was against it. It was basically Kung-Fu Panda. Panda people (nevermind that World of Warcraft already contains werewolves and cow-people - people seem to have forgotten that) who live in a Chinese-inspired land, and are masters of Kung-Fu. A lot of people stopped playing when that was announced (though the Chinese Panda race, Pandarens, had actually been in existance in Warcraft years before Kung-Fu Panda was released). But when it came out, I daresay, it has exceeded Wrath of the Lich King. It is an amazing expansion, beautiful landscape, gorgeous soundtrack. It's honestly the best expansion yet. There is plenty to do at max-level, not including raids, and it's pleasant to go through multiple times. There are only a few complaints I have, the biggest of which being that there isn't a main antagonist. In the Burning Crusade, it was Illidan; in Wrath of the Lich King, it was the Lich King; and in Cataclysm, it was Deathwing. Sure, there were other big villains, but those were the main baddies. But at the same time, Mists of Pandaria was an "accident", in that the Horde and Alliance just happened to stumble across Pandaria, and bring their war against eachother to those shores. Instead of there being a single villain to turn their attention to, Mists of Pandaria focused more on the mutual hatred between Horde and Alliance, and the war that had been playing out between them for decades. I don't know what the next expansion will be, but I do know that there is one villain, the biggest of all, who will certainly be the last we'll see: Sargeras. Sargeras was responsible, along with the Old Gods, for destroying Neltharion's mind, and causing the Aspect of Earth to become Deathwing, the Aspect of Death. His madness spread to his brood, and the other brown dragons became black dragons with him, and were corrupt and evil and full of hate, desiring to turn the world into a place just for them. Sargeras was responsible for the corruption of Illidan, originally a Night Elf, and of the Highborne, also a faction of Night Elves, and caused the world to initially break apart, creating the Maelstrom, and causing the Highborne and most of the Night Elves' world to crumble into the sea. This, along with the corrupted magic they had been using, caused some of them to become Naga. Sargeras was responsible for the Lich King, in a way: Sargeras corrupted the Orcs, which lead them from the path of Shamanism to becoming Warlocks, and he gave them a way into Azeroth so that he could take the planet for his own and consume it. He specifically corrupted Ner'zhul, the head Shaman, and it is Ner'zhul who was torn cell from cell by Kil'jaeden, one of Sargeras' right hand men, and his soul became the first Lich King, King of the Scourge, or Undead. The Lich King in the titled expansion is not Ner'zhul, but it is rather Ner'zhul's soul corrupting someone else and controlling him to do his bidding, which is also the bidding of Sargeras. As mentioned already, Sargeras corrupted Deathwing, and so the Cataclysm happened, and it is Sargeras who is still trying to find a way into Azeroth. Sargeras is a Titan, which means he is one of the race who created life and the planets. He is not a force that can be taken down easily, and I think that, when we finally have to fight him - because we will - we will need another Titan on our side. The stories of the expansions are all related together, and World of Warcraft also has a series of really great books which explain the lore of the world. I've read all but the newest, and it's for the story that I love World of Warcraft so much. Well, I also love the magic, the races, the world, and the whole gaming thing, but the story is a big part of it too.